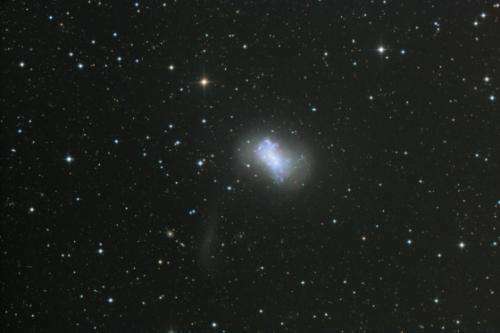 (PhysOrg.com) -- A team led by UCLA research astronomer Michael Rich has used a unique telescope to discover a previously unknown companion to the nearby galaxy NGC 4449, which is some 12.5 million light years from Earth. The newly discovered dwarf galaxy had escaped even the prying eyes of the Hubble Space Telescope. The research is published Feb. 9 in the journal Nature. The larger, host galaxy, NGC 4449, may be "something of a living fossil," representing what most galaxies probably looked like shortly after the Big Bang, Rich said. The galaxy is forming stars "so furiously" that it has giant clusters of young stars and even appears bluish — a sign of a young galaxy — to the eye in large amateur telescopes, he said. NGC 4449 has a nucleus that may someday host a black hole and an irregular structure, lacking the spiral arms characteristic of many galaxies, he said. It is surrounded by a huge complex of hydrogen gas that spans approximately 300,000 light years, which may be fueling its burst of star formation. Rich collaborated with Francis Longstaff, a professor of finance at the UCLA Anderson School of Management and an amateur astronomer, in acquiring and using a specialized telescope designed to take images of wide fields of the sky. Known as the Centurion 28 (the diameter of the mirror is 28 inches), the telescope, and the observatory the astronomers used, are located at the Polaris Observatory Association near Frazier Park, in Kern County, Calif.
With the C28 telescope, the astronomers discovered the companion dwarf galaxy, which has "evidently experienced a close encounter with the nucleus of NGC 4449," Rich said. Dubbed NGC 4449B, the dwarf galaxy has been stretched into a comet-like shape by this gravitational encounter. NGC 4449B had remained undetected because it is more than 10 times fainter than the natural brightness of the night sky and some 1,000 times fainter than our own Milky Way galaxy. The dwarf galaxy is in a "transient stage," Rich said, and will soon — by astronomical standards — be dissolved. The Milky Way has a similar companion, known as the Sagittarius Dwarf galaxy, which has been wrapped around our galaxy as it orbits and which loses its stars to the Milky Way's gravitational tug. With the help of the wide field of the C28 telescope and special image processing conducted by Christine Black, a UCLA research assistant, and David Reitzel of the Griffith Observatory, the astronomers were able to subtract the light of the sky and that of the outer parts of NGC 4449 to reveal the new galaxy. NGC 4449B is stretched into a gigantic "S" so large that if one end were placed at the center of the Milky Way, the other end would reach all the way to the sun's position. In fact, NGC 4449B is the largest dwarf galaxy known in the "local group" that also includes the Milky Way and the Andromeda galaxy. The deep images of the larger NGC 4449 revealed other surprises as well: a strange arc of stars that might be an ingested galaxy, and a "remarkable halo" of old stars that appears to consist of two parts; the outermost part of this "halo" population was unexpected, and makes NGC 4449 equivalent in size to the Milky Way. The origin of these old stars is not known, but they may have been acquired when galaxies similar to NGC 4449B fell into NGC 4449 and were shredded, Rich said. 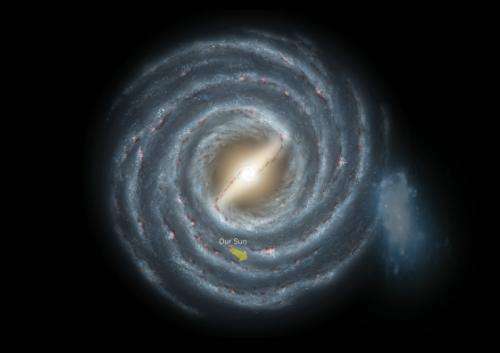 Andrew Benson, a co-author and a senior research fellow in theoretical cosmology at the California Institute of Technology, said, "Our own galaxy, the Milky Way, has a host of smaller galaxies which orbit around it. On much larger scales, we see groups and clusters of galaxies which orbit under the pull of their mutual gravitational attraction. Gravity has no preferred length scale, so we'd expect that dark matter (which interacts only through gravity) should behave in more or less the same way on all scales. For a galaxy like NGC4449, that means it should have its own system of small dark-matter satellites orbiting around it — assuming that dark matter works the way we think it does." The C28 telescope used for the discovery places the CCD camera at what is known as the "prime" focus, in front of the light-collecting mirror. The telescope is produced by the Astro Works Corp. of Arizona, led by James Riffle. Longstaff and Rich expect to have the telescope ready for remote control later this year, perhaps this summer. Longstaff led the observatory and telescope project. The dwarf galaxy was also independently discovered by a team of scientists led by David Martinez-Delgado of the Max Planck Institute for Astronomy in Heidelberg, Germany. This team included Aaron Romanowsky of UC Santa Cruz and amateur astronomer R. Jay Gabany. Their study, accepted for publication in the Astrophysical Journal Letters, shows the dwarf resolved into individual stars by the 8.2-meter Subaru telescope. "The dwarf galaxy was also independently discovered by a team of scientists led by David Martinez-Delgado.."
No Henrik, that prize belongs to you. For people who don't know this guy, he believes that galaxy is 6,000 years old and his god created it with his word with its light already halfway in transit to us! Regardless of who discovered what and when the article was interesting until they added dark matter. The article further on about this same galaxy is more interesting. I thought we were bit further out from the center of the galaxy... Anyhow, always nice to know of our closer neighbors.